Hope you like them! Please let me know in comments if you run into any weird bugs, or if something's missing that you were really hoping for. Also, please post in comments what you'd like me to work on next. When I return from DragonCon I'll pick a set and get your specific requests for whatever it is. Wow, thanks Jeff! They’re looking really good. Can’t wait to use them. 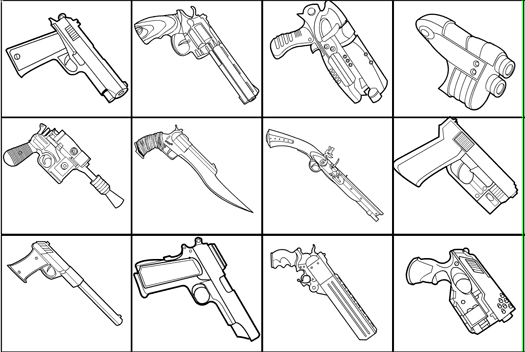 For the next set, I would like to suggest rifles and the like. Oh and Jeff, not to complain or anything, but could it be possible to include the tear gas gun and the needle gun, and maybe elbow support and laser sight as separate accesories? I was really hoping that they would make it into the program. Once again, thanks for all the stuff you’re doing Jeff and thanks for making this awesome program! Jeff these look absolutely amazing! – a m16,m4,ak-47, really long 15-30 round pistol clips- i think the clips should be interchangeable. -stocks for all the weapons please and thx u.
p.s. u could find all this stuff on the gunsite i gave u.
I think you should put in rifles or armour next. I’d love some Samurai armour! Perhaps you could work on some new wings. Great work, Jeff! For the next addition, I vote for Pole arms. I don’t think there are any pole arms as of now. As a long time player of the the CHAMPIONS RPG I’d really like to see a pin-pong ball gun! Foxbat rules! Thanks Jeff! Now with the flintlock mechanism, we can make anything a gun, like people have in the past. Pole arms next sounds good. Ah, those’re byootiful, man. Thanks! For the next set, how’s about some more spandex tops and/or legwear? Pole arms sound great or armours too. Btw, thank you again for your work! I agree with Dennis, rifles or armor next. looks great Jeff, but sadly i have a bug to report. now when i try to load my heroes the guns and blades do not load as well. Hey Jeff! Props for the incredible pistols! I don’t mean to be picky, but I was really, really hoping for the .50 S&W 500 Magnum and Beretta 92FS over anything else. 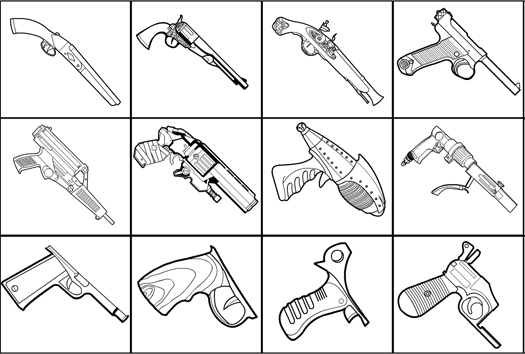 I noticed you added a Colt magnum and the Boltok Magnum, but I would love to see exact replicas of the Beretta and S&W. I would really appreciate it Jeff. Thank you. I use hero machine for running a D&D campaign, so I doubt I’ll ever use the guns. What I would use a lot though would be animal legs. I would love to be able to make Merfolk, Centaur, Ents, Gorgons, etc. Please, please, please! Impressive update. 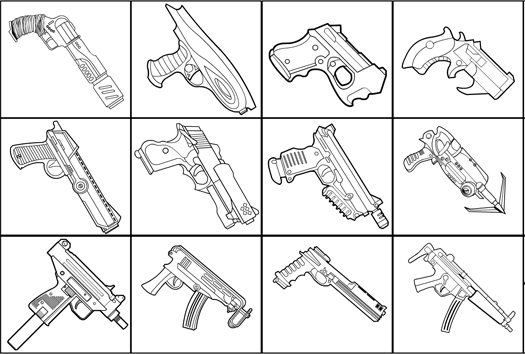 That’s a nice variety of guns. I vote for armors or pole arms. There is a bug about the colors : instead of the colors palette , there’s nothing. Hey Jeff, the tenth pistol of the first page and its parts are darker than they should be. So the deal on this set was that at 80+ items I was hitting the limit. Not being a gun afficionado the difference between the existing magnum and the Desert Eagle wasn’t big enough to take up another slot. But I am persuadable on that point, just ignorant. Could you do the same thing for rifles, break apart all the existing items into separate components?